When the deputy commander of Rome’s Imperial Security Service is assassinated on the island of Rhodes, Cassius Corbulo swiftly finds himself embroiled in the investigation. Assisted once more by ex-gladiator bodyguard Indavara and servant Simo, his search for the truth is complicated by the involvement of the dead man’s headstrong daughter, Annia. 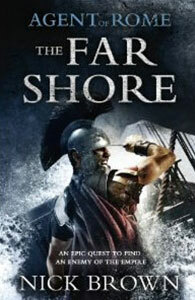 Braving hostile seas, Cassius and his allies follow the assassin’s trail south aboard a ship captained by a roguish Carthaginian smuggler and manned by his disparate, dangerous crew. Their journey leads them to the farthest reaches of the empire; to a ruined city where the rules of Roman civilization have long been abandoned, and a deadly battle of wits with a brutal, relentless foe. “Brown has become a master of his trade, serving up thrilling Roman history and mystery courtesy of a band of now hard-bitten combatants and comrades whose adventures in imperial wastelands and far-flung hotspots are becoming the stuff of legend.” – Lancashire Evening Post. “A fast-paced, action-packed novel tinged with humour which brings alive the harsh reality of the period, the people and the culture.” – Historical Novels Review. “Character is important in Nick’s books. Containing his protagonists to the three men with a small supporting cast means that the characters get a lot of exposure and shine – the interplay between them is always stunning … Read the book. Read all three if you haven’t. You won’t regret it.” - S.J.A. Turney, author of the Marius’ Mules series. “I can’t say how much I enjoyed this book – finding the mixture of plot, characters, action, humor and the historical setting perfectly balanced .” – S.D. Sykes, author of Plague Land. Nick, just wanted to say how much I enjoyed this last book, keep up the good work, its been great reading. Thank you Beks. Hope you enjoy book IV this year, Nick.